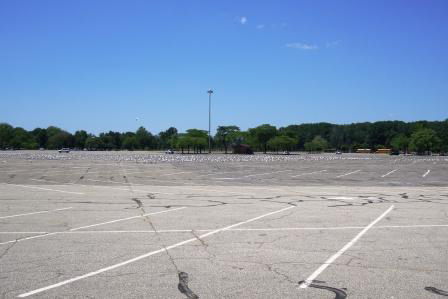 A giant Southeast Michigan parking lot that sees more seagulls than cars is in the midst of a green overhaul to cleanup runoff into Lake St. Clair. Scientists monitoring the runoff before and after the construction hope to show just how much the project will help a nearby beach plagued by closures. In the early days of the Huron-Clinton Metropark system, the 42-acre lot outside of Lake St. Clair Metropark was meant to be the terminus for cars traveling along a parkway connecting a network of parks around the Detroit area, according to Shawn McElmurry, assistant professor of civil and environmental engineering at Wayne State University. But with traffic turning instead to the freeways that were constructed across the area, the lot never saw the use that planners anticipated. Droppings from those seagulls are among the reasons that the lot has been identified as a possible contributor to water quality problems along the park’s beach. Managers closed the beach to swimming nine times in 2009. The Huron-Clinton Metropolitan Authority received funding under the Great Lakes Restoration Initiative to alleviate the problem with green infrastructure. Several swaths of pavement will be replaced with vegetated bioswales. The bioswales will collect runoff and direct it into a series of constructed wetlands that will drain into a nearby natural wetland called Point Rosa Marsh that feeds into Lake St. Clair. Projects funded under the restoration initiative require a monitoring element, and that’s where McElmurry comes in. Before construction began this summer, he and his collaborators installed a monitoring station with a refrigerated autosampler and water quality sonde in a drainpipe where all the runoff from the parking lot flows before entering Black Creek, which empties into Lake St. Clair. McElmurry has taken a novel approach with the autosampler station. Samplers are often programmed to begin filling bottles when associated sensors detect a rise in water levels, signaling that runoff from a rain event has arrived. The station at Lake St. Clair Metropark is instead triggered by a rain gauge that starts up sampling as soon as rain begins to fall. McElmurry said the data they’ve collected there on nutrients and E. coli bacteria should be able to serve as a baseline dataset to gauge potential water improvements brought by the green infrastructure. 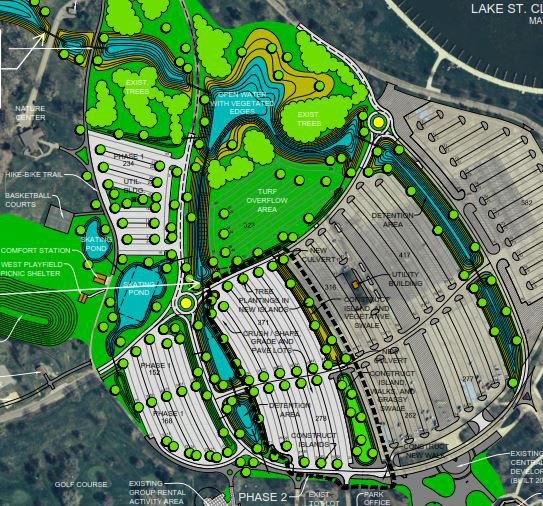 Once construction is complete, they’ll enlist another set of monitoring stations to track the quality of water flowing off of the parking lot and into the bioswales, out of the bioswales and into the retention ponds, and finally our of the ponds and into the wetlands.